Gather your loved ones around this beautiful Berlin Gardens Round Poly Pub Table and get the most out of your next outdoor get together. 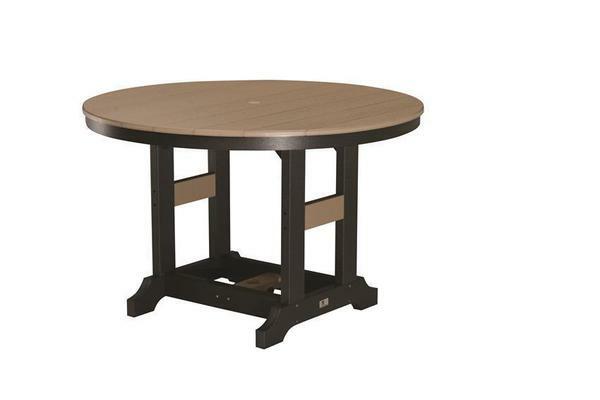 At 48" in diameter, this pub table will comfortably seat four people and also includes an umbrella hole, for those extra sunny days! Easily incorporate our Berlin Gardens Comfo-Back Counter or Bar Chairs, for a seamlessly look on your outdoor dining decor! Each piece in our Berlin Gardens Collection is handcrafted by highly skilled Amish woodworkers, from eco-friendly poly outdoor furniture. Poly lumber is constructed of 99% post-consumer recycled plastics, which offers a usable lumber that is maintenance-free and will last decades!